Do you like sewing projects? How about vintage 1960s mod coats? Check out this Forstmann trench. Vintage 1960s Forstmann Jacket. 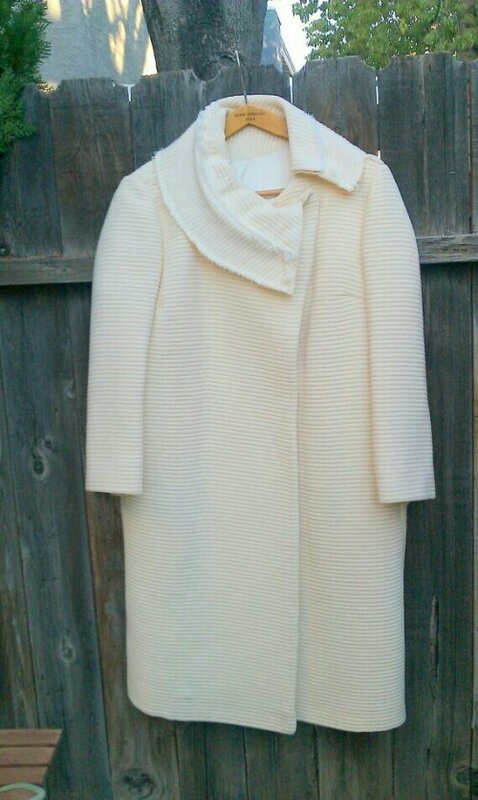 This Ivory colored Winter coat was wonderful ribbed fabric. It is VERY heavy thick fabric. Perfect for snowy weather. A Line shape. It is a project piece! Some one not very nice stole te fur of this baby. I rescued her from being put down, heh She needs some loving hands to replace her collar and she will be PERFECT! There are a couple snags on the front right side, shown in pics. Very small. I would love to see how this one turns out! All measurements are clothing laying flat, measure likewise to a garment of yours or double the measurements for circumferences. shipping is high for clothing because of its size and weight. Comments Off on Do you like sewing projects? How about vintage 1960s mod coats? Check out this Forstmann trench.